Start the ConnectCode Barcode application. Leave all settings as default and click on the Encode button to generate a Code 39 barcode. Click on the TextEdit->Preferences menu item and ensure that the "Rich text" option is selected. Go back to the ConnectCode Barcode application and click on the Copy button to copy the barcode. 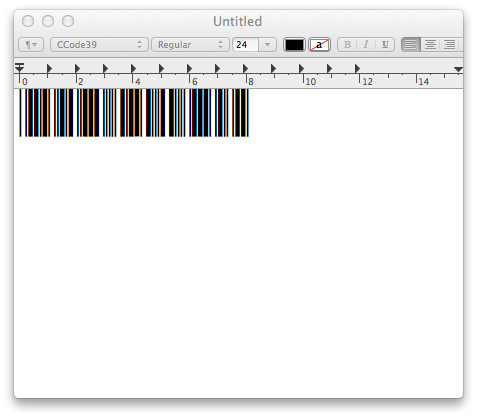 In the TextEdit application, click on the Edit->Paste menu item to paste the barcode. If the barcode does not appear as shown in the diagram below, it is likely that the barcode fonts are not setup as specified in the previous section. 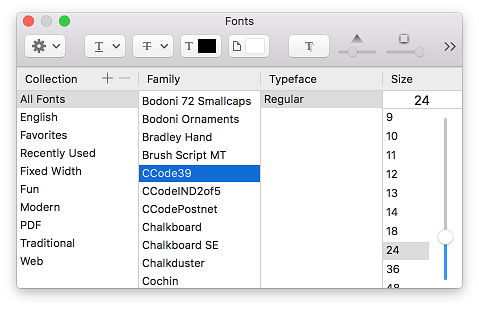 For OS X El Capitan users, you can click on the menu Format->Font->Show Fonts option in TextEdit to see the barcode fonts (All Fonts->"CCode...") available. Click on the File->Print menu item to print the document. Test the barcode by scanning it using a barcode scanner.